Is Kombucha Safe for Pregnancy? What Are the Benefits of Raw Ginger Juice? Tea has enjoyed a longstanding popularity, being the most-widely consumed beverage for centuries, and with good reason. Scientists have only relatively recently discovered the beneficial compounds in tea, but people have known it as a digestive aid since its inception. 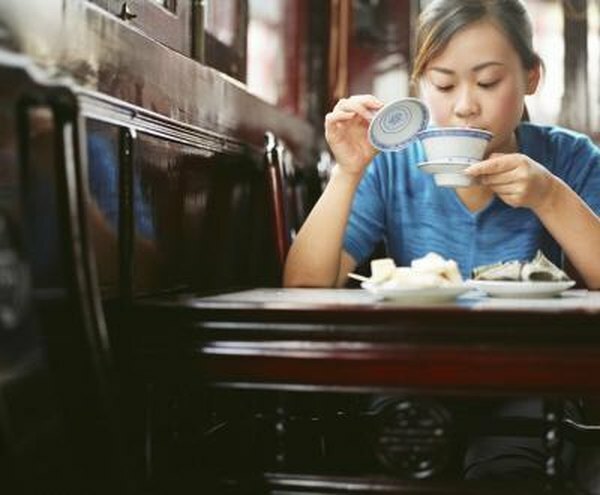 Only now are researchers beginning to understand what it is about tea that makes it soothe the stomach, and the mechanism at work depends on the condition it is working upon. Tea is only tea if it comes from the Camellia sinensis plant. Other herbs may be dried and soaked in hot water, but those beverages are properly called tisanes, not tea. True tea simply is the leaves and stems of the Camellia, harvested at different points to produce different teas -- the younger the leaf, the lighter the tea. White and green teas are harvested young and processed immediately, but black and oolong teas are allowed to mature, then fermented before processing. All teas contain anti-inflammatory properties to some degree. If your digestive problems are caused by inflammation due to Crohn's disease or another chronic disorder, regular tea consumption might reduce your symptoms. A 2006 study in the journal "Life Sciences" found that black tea extract prevented pancreatitis in rats by calming the production of amylase and lipase. These two enzymes are a vital part of digestion and their regulation might reduce symptoms of certain conditions. That's not to say tea will help every digestion problem, since they can be caused by many things, inflammation being only one. Tea leaves also contain antioxidants -- the younger the leaf, the higher the antioxidant content. Antioxidants help prevent oxidative damage, basically stopping inflammation before it starts. As the tea moves through your digestive system, it protects the lining of your small intestine by refortifying depleted antioxidant levels to help protect against free radicals caused by stress. Both physical and emotional stress can be damaging to your digestion, and diseases like inflammatory bowel disease produce extra intestinal stress. Regular consumption of a tea high in antioxidants can help mitigate that damage but cannot replace prescribed medication. Unless your digestion problems are caused by inflammation, the tea leaves themselves are probably not the source of your remedy. Although tea has been used as a digestive aid for centuries, there is little evidence that it cures minor digestive ailments. The most likely cause of the cure is the water. Drinking a cup of warm water after a meal helps your stomach break down food faster. If you had a stomach ache from overindulging, the pain would lessen as the food made its way farther along your digestive tract. It would seem like the tea made you feel better, when it really just helped your body do its job more efficiently. What Does Ginger Do for the Body?